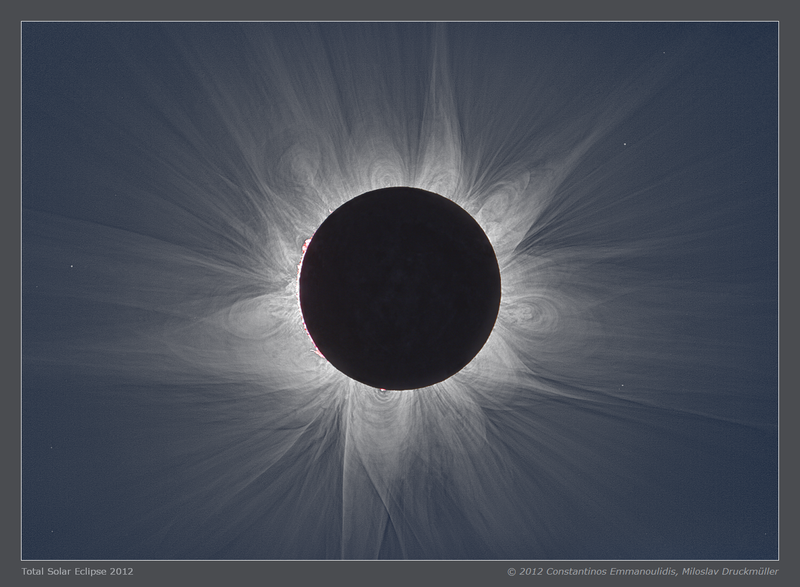 This image shows typical corona for solar maximum which is very different from corona during 2008, 2009 and 2010 eclipses. The Sun was only 13° above the horizon and observing conditions were not absolutely perfect. That is why I was afraid that to achieve the quality of eclipse images typical for several previous eclipses is impossible. The result was a pleasurable surprise for me. The only clearly visible difference in quality from previous eclipse images is the worse visibility of the lunar surface which is, of course, highly unimportant. The contrast of lunar surface was significantly lowered by thin high clouds. The influence on display of inner corona was negligible. The full resolution image you may download here. 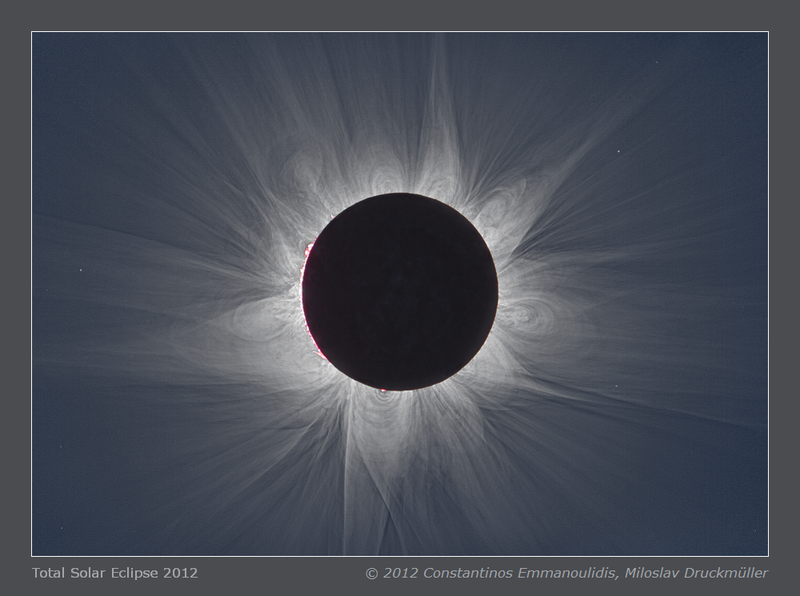 Processing Composition of 41 eclipse images. 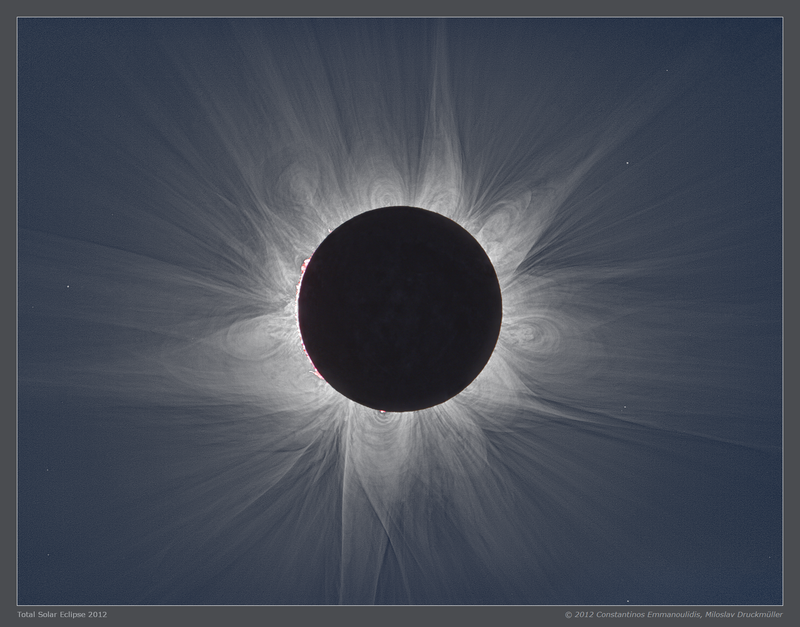 Eclipse images were calibrated by means of dark frames and flat-fields (totally 1621 images), aligned by means of phase correlation, composed by means of LDIC 5.0 software, processed using Corona 4.1 in order to visualize coronal structures. Final processing was done using ACC 6.1 software. Note The graph above the table shows the average values of the relative number of sunspots in which the red line indicates the time of 2012 eclipse. The data from the World Data Center for the sunspot index, (Solar Influences Data Analysis Center, the Royal Observatory of Belgium) were used. Orientation Image must be rotated 23.75° clockwise to achieve standard orientation i. e. solar North up.